Apartment completions keep coming during the colder weather months, at the same time that leasing activity turns sluggish. Thus, after occupancy normally peaks in 3rd quarter, there’s typically a slide in performance in 4th quarter and 1st quarter. As we move back into prime leasing season for 2019, U.S. apartment occupancy of 95.2% is off 60 basis points (bps) from the 3rd quarter 2018 figure of 95.8%. While that occupancy decline of 60 bps is within the routine range, a few key metros took bigger hits. The six-month occupancy drop stood at 120 bps in Columbus, Kansas City and Houston. 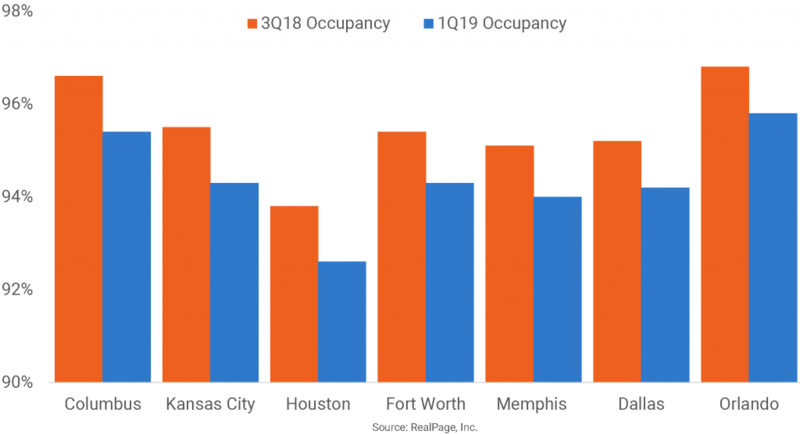 Occupancy backtracked 110 bps in Fort Worth and Memphis, while declines of 100 bps occurred in Dallas and Orlando. Moving against the national pattern, one metro saw occupancy jump meaningfully in recent months, with the rate up 110 bps in West Palm Beach.